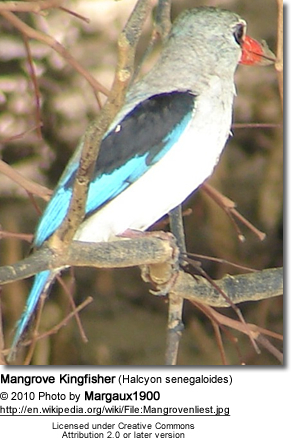 The Mangrove Kingfisher (Halcyon senegaloides) is a relatively common Southern African Tree Kingfisher with a large range. This species usually stays close to the coast, although may move up river systems. It averages 21 -23 cm in length (including tail). It has an all-red bill and a light grey head. The upperparts are turquoise. It has a black carpal patch on the otherwise white underwing coverts. It is a noisy species that utters a loud ringing "cheet choo-che che che" ending in a trill.